The world is familiar with different religious apparel worn by men and women of many different faiths. The Church of Jesus Christ of Latter-day Saints is generally not known for public religious apparel, but faithful adult members that make sacred promises to God's commandments and the gospel of Jesus Christ in the LDS temples, wear a garment under their clothing that symbolizes their commitment to these promises (which are also referred to as covenants). The temples of The Church of Jesus Christ of Latter-day Saints are the most sacred and holy places on earth. They are a sanctuary and a safe place, in an often chaotic world. 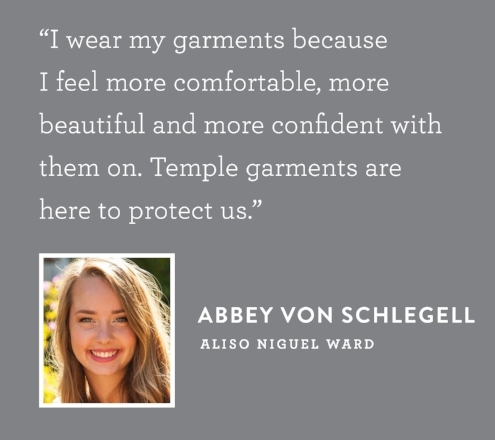 The temple garments are a way to bring a "piece of the temple back home with you to remind you of your covenants," Beth Garlock (Laguna Niguel Stake member). The LDS garments are revered and cherished by those that wear them, so when they are ridiculed or made light of it can be offensive to members of The Church of Jesus Christ of Latter-day Saints. When talked about with respect, members welcome questions and discussion about their feelings about garments. The quotes in this post are from members in the wards (congregations) of the Laguna Niguel Stake of The Church of Jesus Christ of Latter-day Saints. Our understanding of God's commandments and the love we can find in their value, promises and protection can make them easier to follow. It is also through the practice and daily application of following commandments where we can find freedom, in what before may seem like a limitation. 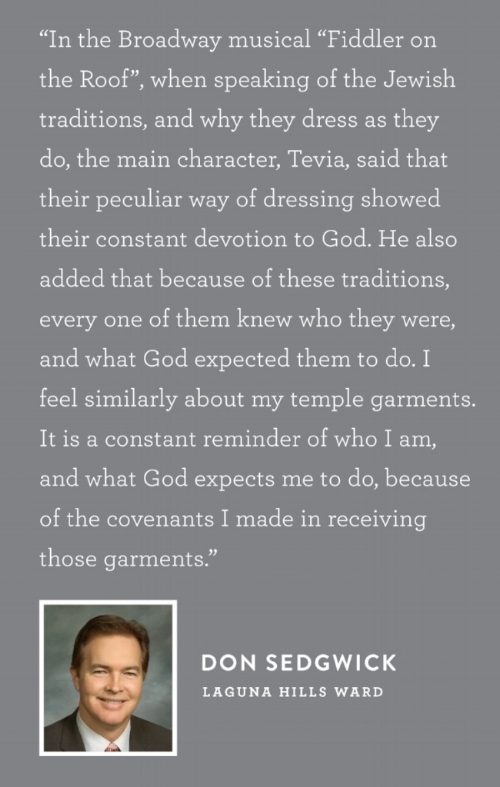 Members of The Church of Jesus Christ of Latter-day Saints view their temple garments no differently. In what may seem like a limitation to others, the wearing of the garment provides a freedom and protection in what they represent. To learn more about Temple garments click here. Or view the video below which explains the importance of the garment along with other symbolic vestments worn during temple worship.